Erysimum croceum M. Pop. (Brassicaceae) is an endemic species, growing only in Trans-Ili Alatau. It is included into Kazakhstan Red Data Book. The aim of this study is to compare two populations of Erysimum croceum M.Pop identified in Trans-Ili Alatau region, for which morphological and ecologicalanalysis was undertaken. Plant communities of the 1st population growing in Small Almaty gorge (N43*06.316’, E077* 04.184’) are dominated by indigenous plants with a significant proportion of endemic taxa, while the 2nd population from the Big Almaty gorge (N43* 04.790’, E076* 59.512’) is growing in subruderal positions with the presence of other plants. Statistical analysis of the morphological traits revealed significant differences between the two populations. In this article summary on comparative analysis of the main features of morphological and anatomical structures of endemic species Erysimum croceum is given. To identify the cause of its disappearance we studied seed germination and growth of seedlings. Seedgermination is low and only reaches 18 %. Morphological structure of seedlings on the 45th day showed overall length of sprouts 6.67±3.84 cm, hypocotyl length 1.12±0.06 cm, root length 5.49±3.57 cm, leaves length 0.39±0.63 cm, and leaves width 0.2±0.2 cm. The anatomical features of Erysimum croceum were defined. Stem diameter in Erysimum сroceum collected from the 1st population equals to 1052.92±11.7 μm, epidermis thickness – 25±0.9 μm, primary cortex thickness – 96.24±0.6 μm, core diameter – 796.51±5.9 μm. Stem diameter in Erysimum сroceum collected from the 2nd population equals to 996.38±9.8 μm, epidermis thickness – 21±0.7 μm, primary cortex thickness – 80.98±0.4 μm, center circle diameter – 701.59±8.7 μm. Anatomical sections of rhizome and leaf were compared on virginal and generative stages, while the stem was studied only at generative stage. Main specification into the inner structure is designated by accumulation of sclerenchyma between conducting bundles in central cylinder and alternative location of small and large bundles. KURMANBAYEVA, M. S. et al. Anatomical features of the rare species of Erysimum croceum M.Pop. from Trans-Ili Alatau. International Journal of Biology and Chemistry, [S.l. ], v. 11, n. 1, p. 97-105, aug. 2018. ISSN 2409-370X. Available at: <http://ijbch.kaznu.kz/index.php/kaznu/article/view/318>. Date accessed: 24 apr. 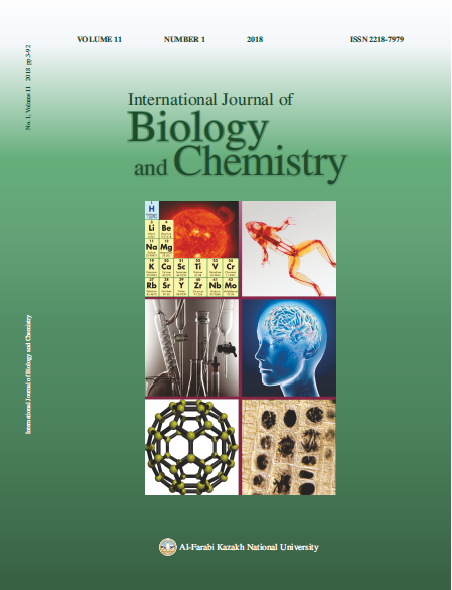 2019. doi: https://doi.org/10.26577/ijbch-2018-1-318.